What are steppe birds? Why are they currently among the most threatened in the world? What measures should be implemented to ensure their conservation? This book stands out as a serious treatise on the biology of steppe birds and the environmental threats they face. It has been authored by recognised specialists in the field of biology and conservation as related to this heterogeneous and peculiar bird group. There can be no doubt that this book will become an essential reference guide for specialists and organizations responsible for the conservation of these habitats. 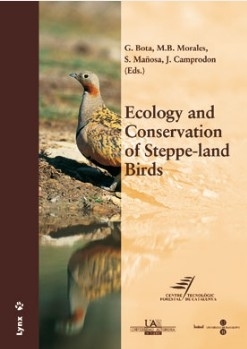 Each chapter in this volume offers a multidisciplinary approach to a conservation problem that transcends a specific bird group, and which requires for its solution a focus on biological, agricultural, economic, political and social aspects. All topics are handled with expertise, written in an engaging and accessible style.